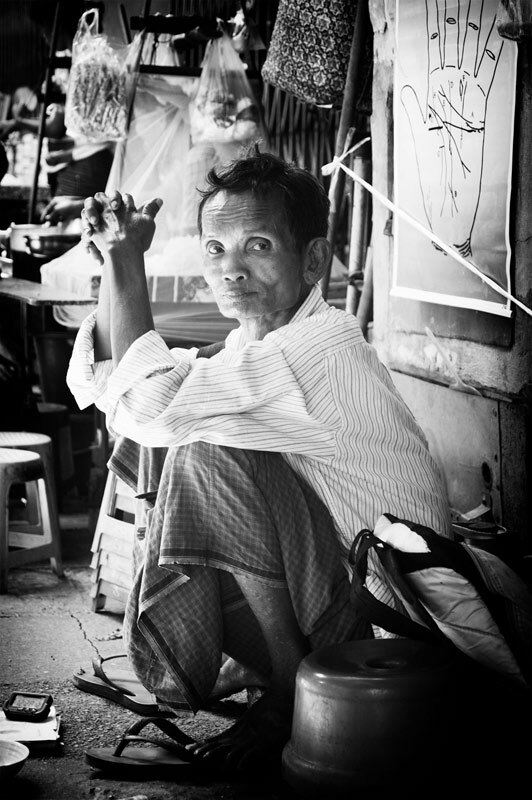 Street Photography in Burma's Capital, shot mainly around lunchtime. 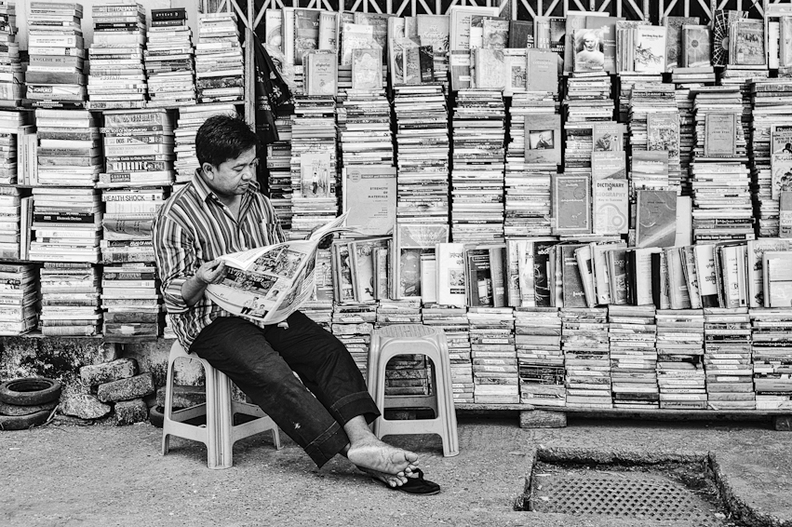 Without a Big Brother in site, a vendor on Book Street reads the days newspaper. 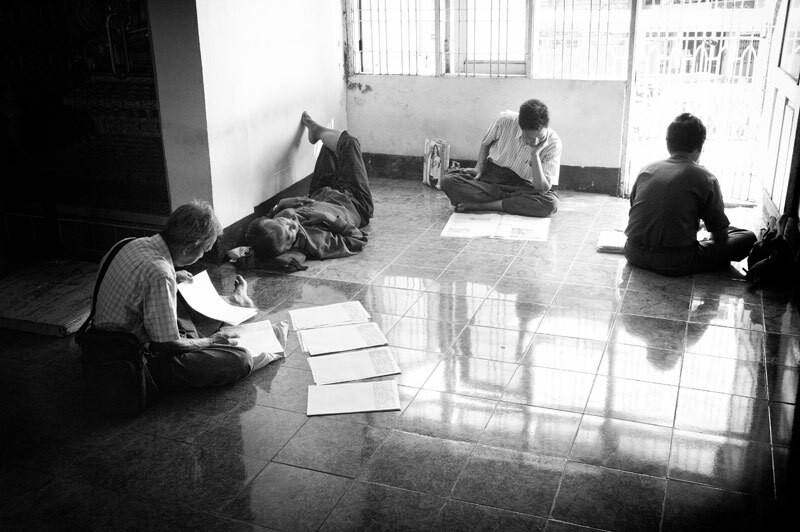 It was joked that, besides 'Burmese Days', George Orwell wrote two other books on Burma - Animal Farm & 1984. 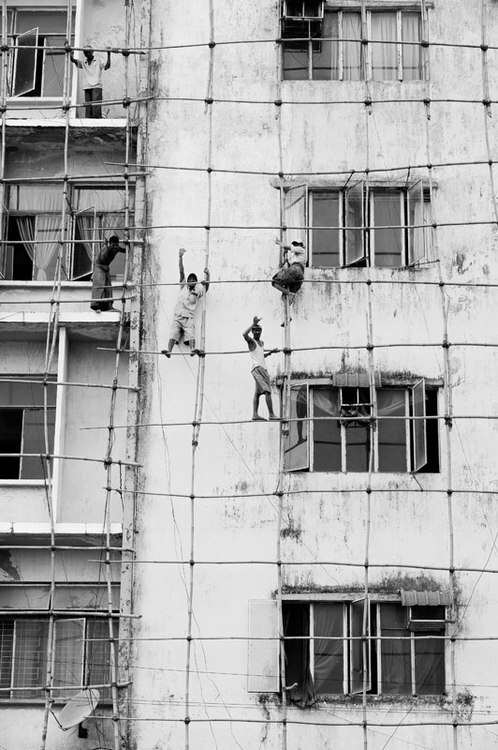 Yangon, Feb 2012. 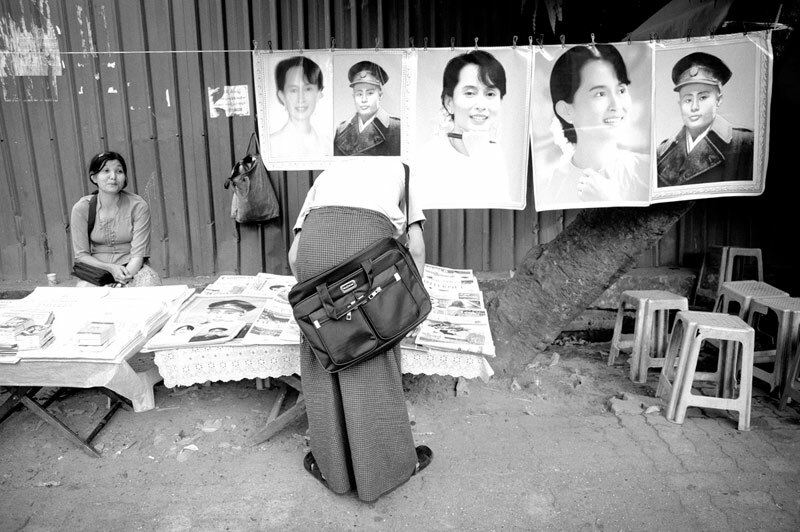 A customer browses through a street vendor's stall selling posters of General Aung San and his daughter, the newly liberated opposition leader Aung San Suu Kyi - an act which would have led to arrest, for both, one year previously. 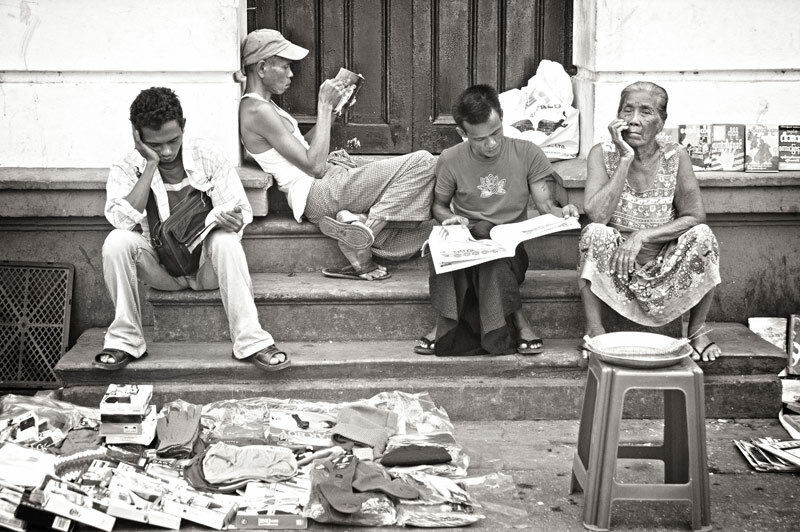 One local told us: It was about 8 months ago, 4 months after 'Our Lady' was released; it was during a local Buddhist festival so the streets were busy and lined with vendors, mostly selling Buddhist trinkets. Then one lady opened up a case and began pinning posters of Daw Suu around her stall. Onlookers watched on in fear and nobody dared go anywhere near her stall. A short while later some police passed by. To everyone's surprise they did nothing. With renewed courage one of the onlookers approached the stall and bought a poster. Everyone watched as the officers watched on. Yet the police still did nothing. En masse, with trepidation dissolved, people descended the stall and the stock of posters was sold out in seconds. 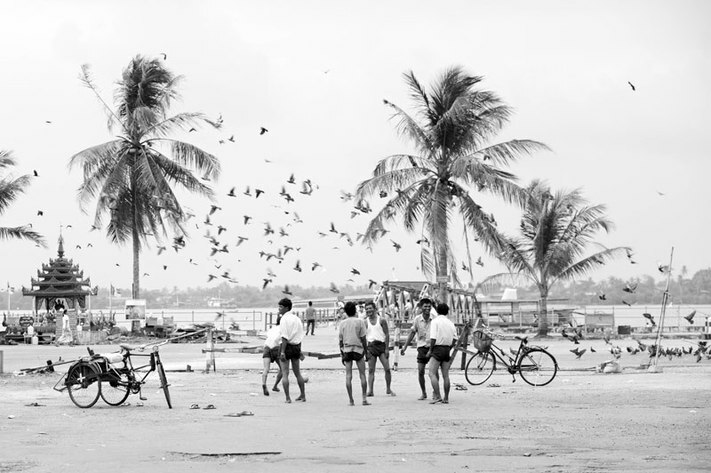 The police still did nothing, and the people finally celebrated the lady's freedom. 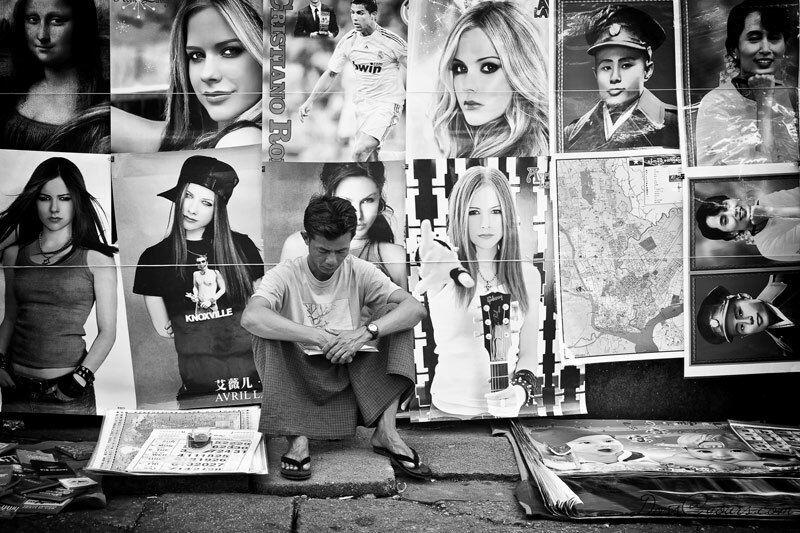 As doors reopen to the West, it's not long before Aung San Suu Kyi and her father take a peripheral position to Western megastars such as Avril Lavigne and Ronaldo. 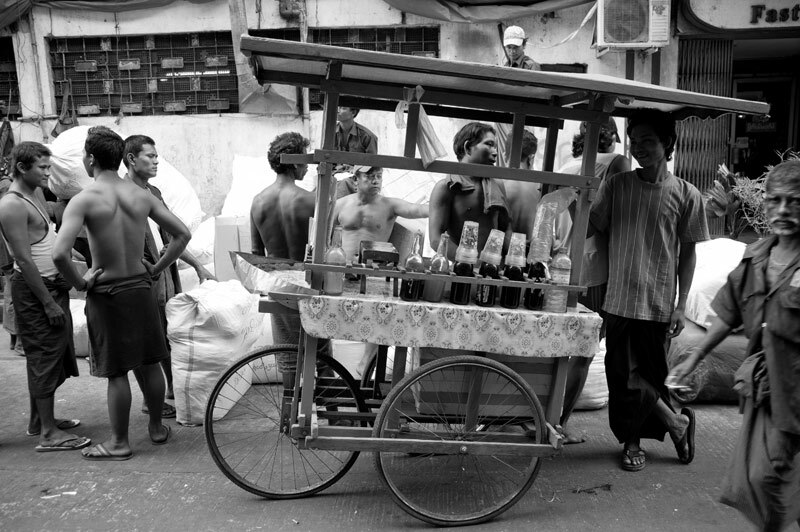 Labourers break a sweat for their daily dollar, and take a break when an entrepreneurial young vendor appears with refreshments. 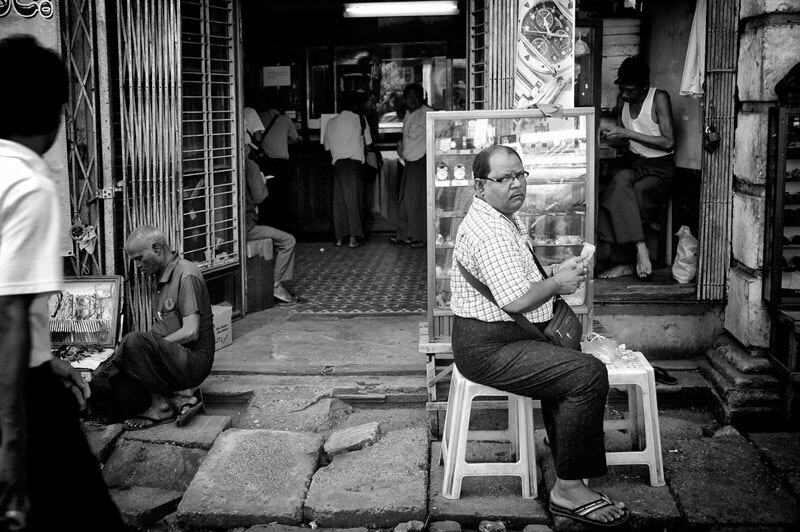 Fortune Teller - Wondering what the future holds on Yangon's streets. 'Under House Arrest'. 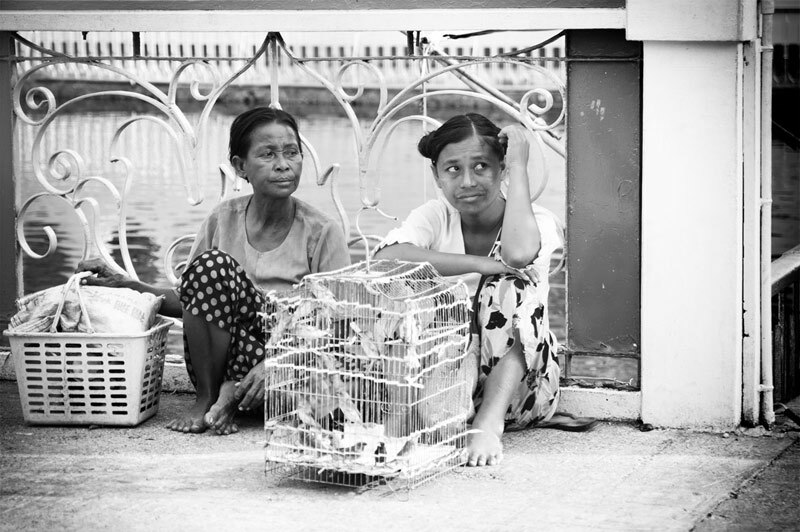 Women wait outside a temple, hoping to sell songbirds to passing worshipers who liberate them to earn themselves Karma points. Raised from chicks & imprinted, these birds take a few rounds of freedom before returning to the cage. 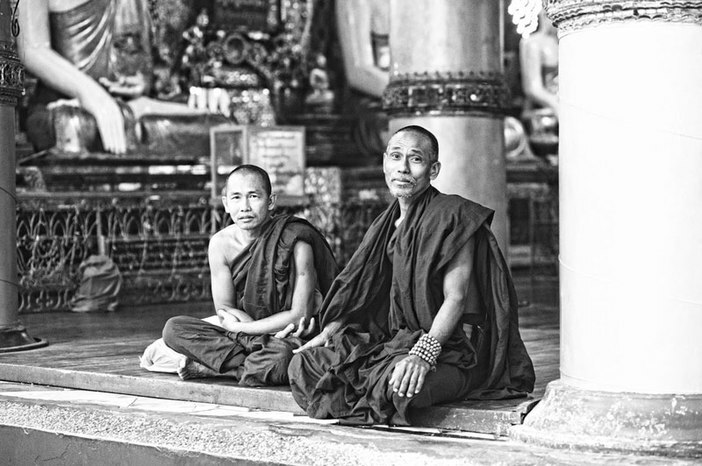 Women traditionally hold a fairly high position in Burmese society, also within it's predominately Theravada Buddhist belief system. 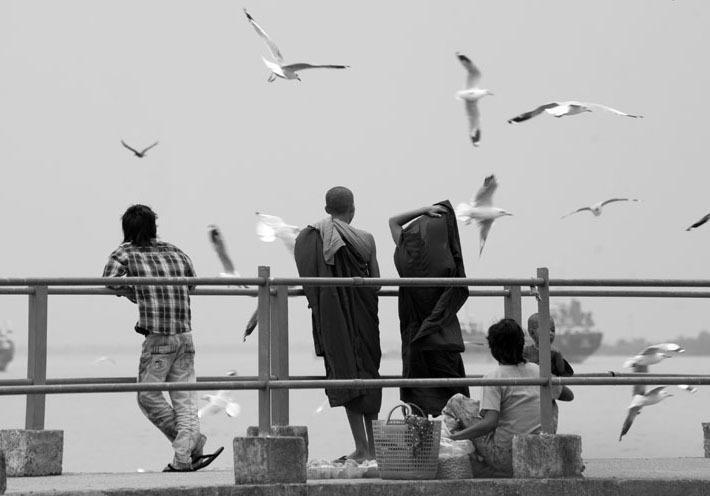 Those temples which do not allow females into the inner-sanctums are finding themselves at the forefront of the current wave of change within Myanmar. 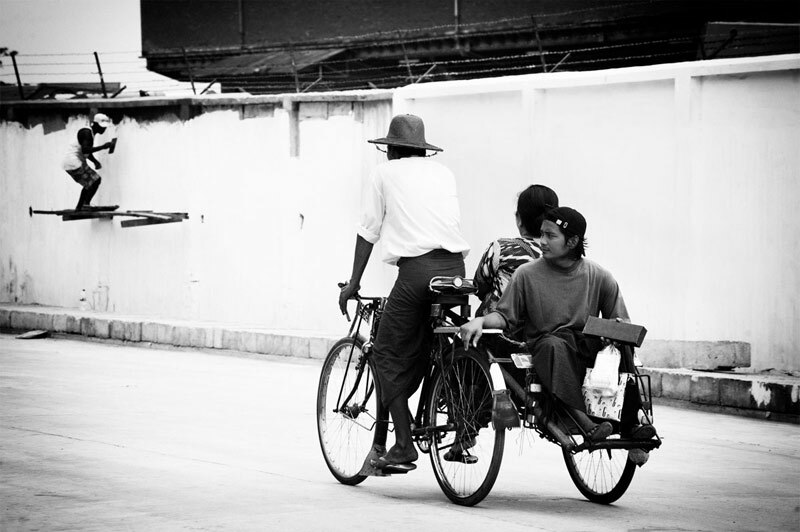 Two friends meet at Sule Pagoda - a Buddhist Stupa in the heart of downtown Yangon. 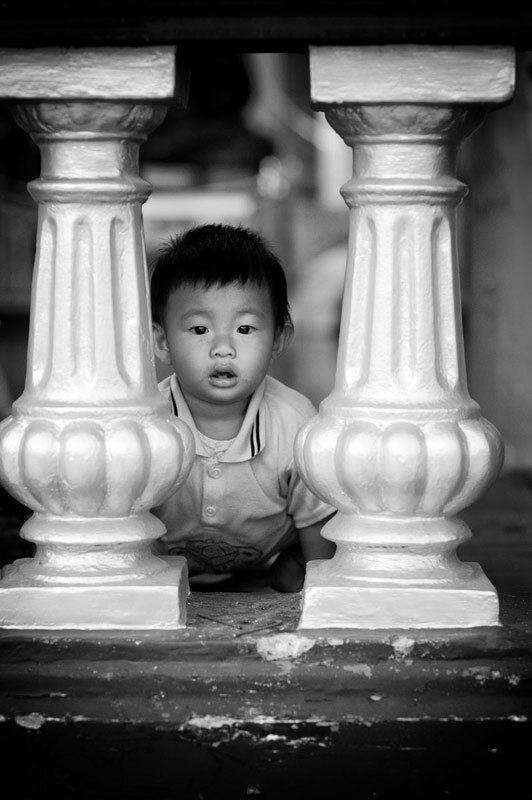 Taking refuge from the midday sun in the cool interiors of Sule Pagoda. 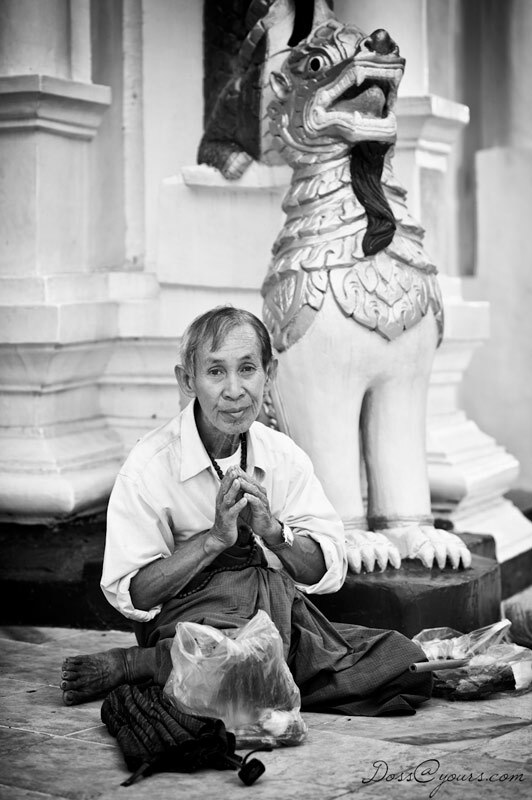 A Buddhist pilgrim at Shwedagon - the most important Pagoda in Burma, and possibly the oldest in the World. A young girl sits waiting in a trishaw, her face covered in thanaka - A skin cream made from tree bark, with anti-bacterial properties which reputedly protects from sun, insects and aging.